Good questions while we listen to the president tonight. Here is a link to the article. I highly doubt that any liberals will want to think hard enough to listen to the answers. In every case — public-sector members included — the livelihood and job security of Hoffa's members depend on a growing economy and robust employers to deliver the wages, benefits, working conditions (and tax revenue) they expect in exchange for the dues money they pay regularly. Does it propose to ease tax and regulatory burdens on the businesses who employ people like them? Does it promise to deliver — finally — a federal budget that begins to offer some certainty to gyrating markets? Are his proposals more likely or less likely to benefit your employer, which could benefit you? Are whatever tax reforms he seeks permanent or the temporary kind that tend to deliver diminishing returns? In short, does the president show any inclination to leverage the power of a well-capitalized private sector? Or is the core of his plan a bid to take advantage of historically low Treasury bill rates, to increase federal borrowing, to focus the proceeds on public works projects and direct aid to cities and states, leaving the bill for whomever comes next? The answers will speak for themselves. Posted in Politics. Tags: Barack Obama, Detroit News, Diminishing Returns, Federal Budget, Hoffa, Inclination, Job Security, Joint Session Of Congress, Liberals, Livelihood, Obama, Politics, President Obama, Private Sector, Public Sector Members, Public Works Projects, Rant, Regulatory Burdens, Riffs, Simple Test, Tax Reforms, Treasury Bill Rates, Wages, Working Conditions on September 8, 2011 by MzEllen. ABC News reporter Terry Moran caused quite a commotion tonight Twitter after writing the following: "Pres. Obama just called Kanye West a "jackass" for his outburst at VMAs when Taylor Swift won. Now THAT'S presidential." In the process of reporting on remarks by President Obama that were made during a CNBC interview, ABC News employees prematurely tweeted a portion of those remarks that turned out to be from an off-the-record portion of the interview. This was done before our editorial process had been completed. That was wrong. We apologize to the White House and CNBC and are taking steps to ensure that it will not happen again. Can I still agree with him if he was "off the record"? Posted in Politics. Tags: Barack Obama, Kanye West, Obama, Politics on September 16, 2009 by MzEllen. While President Obama claims to have inherited the 2009 budget deficit, it is important to note that the estimated 2009 budget deficit has increased by $400 billion since his inauguration, and the whole point of the “stimulus” was to increase deficit spending to nearly $2 trillion based on the unproven notion that would it alleviate the recession. The 22 percent spending increase projected for 2009 represents the largest government expansion since the 1952 height of the Korean War (adjusted for inflation). Federal spending is up 57 percent since 2001. In 2009, Washington will spend $30,958 per household–the highest level in American history–and under President Obama’s budget, the figure will rise above $33,000 by 2019. The White House brags that it will cut the deficit in half by 2013. The President does not mention that the deficit has nearly quadrupled this year. Merely cutting it in half from that bloated level would still leave budget deficits twice as high as under President Bush. The public national debt–$5.8 trillion as of 2008–is projected to double by 2012 and nearly triple by 2019. Thus, America would accumulate more government debt under President Obama than under every President in American history from George Washington to George W. Bush combined. Posted in Politics. 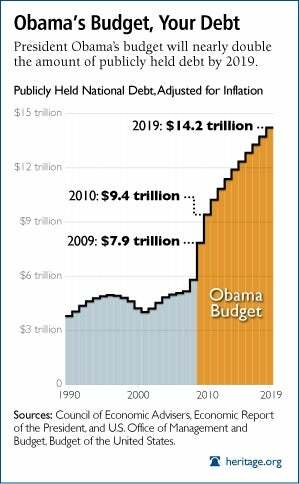 Tags: Barack Obama, Budget Deficit, Deficit Spending, Federal Deficit, Federal Spending, Government Debt, Government Expansion, Heritage Foundation, Miscalculation, National Debt on September 1, 2009 by MzEllen. What’s the problem with Barack Obama jokes? His followers don’t think they’re funny and other people don’t think they’re jokes. Posted in Politics. Tags: Barack Obama, jokes on August 18, 2009 by MzEllen. Posted in Politics. Tags: Barack Obama, George Bush on July 31, 2009 by MzEllen. Since when has any politician in Washington DC (Ron Paul excepted) been concerned with "states' rights"? Posted in Politics. Tags: Barack Obama, DOMA, Marriage, Obama, Politics on June 18, 2009 by MzEllen. What's the difference between a hockey mom and a Special Olympics hockey mom? Posted in Politics. Tags: Barack Obama, Obama, palin, Politics, Sarah Palin on March 22, 2009 by MzEllen. “Make no mistake, tax cheaters cheat us all, and the IRS should enforce our laws to the letter. ” Sen. Tom Daschle, Congressional Record, May 7, 1998, p. S4507. UPDATE: February 2, 9:15AM: WASHINGTON (AP) -- Tom Daschle says he's "deeply embarrassed and disappointed" about his failure to pay more than $120,000 in taxes. Also, the financial disclosure form Daschle filed about a week ago shows that he made more than $200,000 in the past two years speaking to members of the industry that President Barack Obama wants him to reform. Obama has said that no one in his administration who has lobbied on a set of issues within the past two years can deal with the same subject matter. Jenny Backus, a spokeswoman for Daschle, said the money he earned in speaking fees from health care interests do not pose a conflict for the health care reform Obama wants him to lead. Daschle said in a letter to the Department of Health and Human Services ethics office that if he's confirmed by the Senate, he will resign as a senior policy adviser at the Washington law firm of Alston and Bird LLP. He reported earnings of more than $2 million from that firm during the past two years. Daschle also earned more than $2 million in consulting fees from InterMedia Advisors LLC of New York, an investment firm specializing in buyouts and industry consolidation. He said he also intends to resign from that firm upon his confirmation. Posted in Politics. Tags: Barack Obama, Cheaters, Democrats, Ethics Office, Glenn Reynolds, Health And Human Services, Health Care Reform, Irs, Liberals, Policy Adviser, Politics, Tax Hike, taxes, Tom Daschle on February 3, 2009 by MzEllen. One of my co-workers said that he voted for Barack Obama because he (the co-worker) believed that Obama would govern more centrist than what he campaigned. "So...you're saying that you voted for the man because you believed that his campaign promises were lies?" Within minutes of our new president taking the oath of office, the White House web page had been changed. A few of the "changes" on his agenda could directly target Christians and Christian organizations. It could become illegal for a Christian hospital to deny abortions for any reason. It could become illegal for a Christian adoption agency to adopt only to heterosexual married couples. "Changes" directly contradict the Constitution's mandate of "state's rights". FOCA would effectively make ALL abortion issues federal issues and would effectively (and purposefully) overturn laws made at a state level. FOCA would not only take away state's rights to make laws that do not concern things in the Constitution, they also take away the citizen's rights to vote on proposals concerning abortion at the state level. Christians following their consciences in matters of the gay agenda and the abortion agenda. I will pray for our president's safety and health. I will pray that God guide his heart and change his attitude toward the most innocent and vulnerable of our citizens - the unborn. I will pray that God sway his mind in a way that guides his toward the Living God. I will not support him, which includes by necessity supporting his agenda. I will "all work together" in much the same way that liberals "worked together" with President Bush. They fought him every step of the way and were outspoken about where they disagreed. Posted in Christian Issues, Politics. Tags: Abortion Issues, Abortions, Barack Obama, Christian Adoption Agency, Christian Organizations, Christians, Consciences, Constitution, Gay Agenda, Liberals, Living God, Married Couples, Oath Of Office, Proposals on January 22, 2009 by MzEllen.